Worth knowing about the Panorama Room City View. 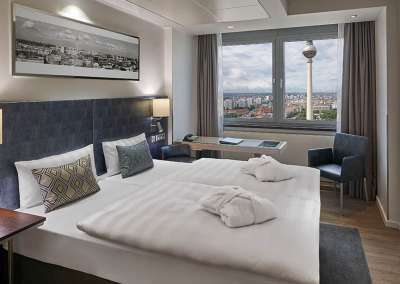 Panorama Rooms City View at Park Inn by Radisson Berlin Alexanderplatz feature windows facing in two directions. Beginning from the 15th floor you will enjoy stunning views of Berlin city centre and all main sights. Rooms are decorated with high-quality furnishings in a modern design and warm, elegant wood tones. A flat screen TV and high-speed internet access are standard in these rooms. These amenities await you in the Panorama Rooms City View.